This is the sixth edition of Balvenie’s Tun 1401 series and the second to be released in the US (batches 3, 6 and 9 have been US exclusives). 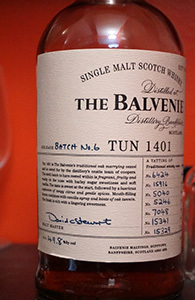 The Tun 1401s, as all the geeks know, are Balvenie’s premium NAS vattings of fairly old whiskies, from different combinations of sherry and bourbon casks. As I recall, more information has been available on the general age range of the component casks of only the early releases–with Batch 2 said to have only one cask filled later than the 1970s and one filled in 1967. I’ve no idea if this means that the more recent releases have more (relatively) younger whisky in them–please chime in if you know more one way or the other. I’ve also read that the series allows Balvenie to salvage some high quality older casks that have slipped below 40% abv (the minimum allowed for Scotch whisky); if so, that seems like a very clever/good solution–certainly preferable from their point of view to dumping it into vattings of younger and cheaper age stated whisky as might have been the case in earlier times. What I do know for sure is that the series has been very reasonably priced in the US compared to similar prestige malts from other distilleries (or even Balvenie’s own 30 yo, for that matter). Batch 3 was released for a little over $200 in Minnesota and both Batch 6 and 9 were available at or near that price as well (we may have had the best prices in the country for these). Nose: Dark honey with dried tangerine peel and some roasted malt. The fruit gets richer with some deep apricot notes along with apricot jam and marmalade. There’s also quite a lot of polished wood (sandalwood) and some mango as well. After a bit the wood gets a little dusty. With even more time there’s some clove and maybe a hint of cinnamon too; definitely more creamy. A drop or two of water brings out the malt and some very mild notes of (powdered) ginger; there’s also more lime now but it’s still all wonderfully integrated. Palate: Not quite as rich on the palate–or at least it’s much brighter here: the fruit and the wood. Speaking of the wood, there’s a slight tannic bite on the palate but it works well with the fruit. With the second sip there’s more of the mango and it’s integrated very nicely with the wood. Some mocha/dark chocolate notes emerge too with time. On subsequent sips the citrus intensifies and there’s more sweetness now too. Water plays up the lime on the palate too, along with the sweetness, but also brings out some more bitter wood as a fine counterpoint. Finish: Long. The fruit gets darker and richer again and the malt emerges late. The wood hangs around. Very well integrated finish. Water keeps the lime going on the finish as well but also makes the wood dustier and a little off balance. Comments: This is really quite lovely: very elegant and balanced and testament to the master blender’s art. Who needs single casks when whisky of such quality is available and (relatively) affordable? The one (minor) knock I would give it is that it isn’t terribly complex. And oddly, it’s quite reminiscent of the Amrut Intermediate Sherry in some ways–which, I guess, means that I am totally walking back what I once said about not buying the notion that Amrut’s quicker maturation in a hotter climate leads to its spirit tasting like much older Scotch whisky. It also has some overlap with brighter, fruitier bourbon from Four Roses. This entry was posted in -Whisky by Rating, 85-89 points, Balvenie. Bookmark the permalink. I should have my review of the 3 up soon. Not sure when I will open my bottle of the 9. The LAWS thing doesn’t have any description of the ages or years of filling of the individual casks, unless I’m missing something. Yeah, the cool kids be lovin’ Batch 3 (for good reason). But this one’s nose turns me into a drooling fool. I think it’s the higher content of old bourbon barrels. MAO, whiskybase’s entries have a little bit on the casks. Here’s Batch 6’s: http://whiskybase.com/whisky/36036. But the actual ages are shrouded in mystery. The one time David Stewart came to LA, he said something off the record about the ages of Batch 6’s barrels. But sampling the Tun wiped my memory clean. All I remember is that all the bourbon casks were over 20yrs, many of them 30+ which impressed me since the 30yo is so much pricier. Thanks. Can I ask what the source of the information is? Had the good fortune to try a few of them individually and was able to get some info from the rep that I luckily wrote down. I’m not sure why I am missing three of them though, that info just wasn’t in my notes. that puts most of the whisky ~40yrs old? hmmmm. Yes, and only one under proof. Unless the three missing casks are much younger/lower strength I’d have to wonder why they would put these into vattings selling for less than $300 when they charge so much for their regular 30 yo. I also wonder why they don’t put this information on the record. They have such a nice website that could display it clearly–or is there some regulatory restriction that prevents them from doing so? and if the Tun 1401s are mostly late 60’s/early 70’s what separates them from the Tun 1858s besides 4x the asking price? I agree it is weird and have thought about it too. Given what is known about the earlier releases (see your info on Batch 2), it does seem like they are being consistent release to release (or at least 2 and 6 sound very similar in the cask selections). The 1858 is perplexing, unless the reason they shield the information is because they just assume/know they can over-price in the Asian market and they don’t want to be so explicit about it? Given it looks like they are expanding the Tun line (see http://whiskycast.com/the-balvenie-to-expand-single-barrel-tun-1401-ranges/), wonder if new releases will see significantly younger casks incorporated in. All I know is I wish I would have bought more of them as I really think all the US releases have been fantastic. When this bottle got past the half way mark I poured six ounces into three two ounce sample bottles and drank up the rest at a quicker pace. Half of one of those two ounce sample bottles went with me to Florin’s house in December and the other half sat in that half-empty sample bottle for another eight months, until tonight. And I am sorry to report that, whether because of the headspace in the bottle or just the vagaries of time, it seems to have degraded a bit. The nose is still very nice but there’s a metallic note on the palate (and no mango). If my review were based on this alone my score would be a bit lower (probably at 86-87 points). Another reminder of how precarious sample-based tasting notes/scores are, or any notes for that matter that are based on just one encounter with a whisky (as so many of mine are). This is not to say that such notes are wrong per se, merely that we often have no idea what the bottle’s story/state was before the sample was poured, and so what stage of the whisky’s life it is that we are reviewing. This is particularly the case with purchased samples—when swapping with fellow geeks we can always ask for that information. Something happens to whisky in half full (or half empty) sample bottles. I’ve had a few degrade completely (specifically the palate) in less than a month. Perhaps the whisky gets one round of oxidation when decanted into the bottle, then the chemical process is later expedited when the whisky is left half finished with all the empty space in the bottle. So I no longer leave half full samples around for more than a few days. I’m sure you know I can tell you the exact story and state of every sample you get from me. None of the stories are interesting, that’s why I write seventeen paragraphs about them in every post. Yeah, the very high-whisky to exposed surface area ratio in a less-than full sample bottle is probably very bad. Contrariwise, I am drinking tonight from a less than full sample bottle of this Lagavulin, Distiller’s Edition that’s been on the shelf for much longer, and it seems to be much as it was at the time of my review, despite being, at 43%, at a lower strength than the Tun 1401. God knows. – Exposed surface-to-volume ratio is very very important. Which means that oxidation will happen much faster in sample bottles than in regulation bottles.